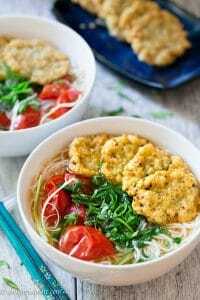 This Vietnamese fried fish cake noodle soup (bun cha ca) features springy fish cakes and a clear broth which is light in body, but it is packed with umami. The most popular breakfast in Vietnam is noodle soups. 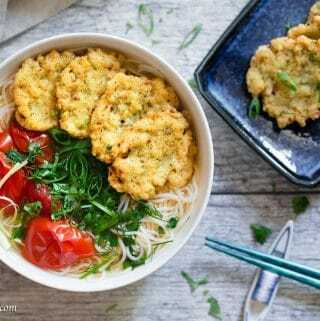 Fried fish cake noodle soup (bun cha ca) is enjoyed by people in all three regions of Vietnam, especially in seaside cities. I was born in a seaside city, so I grew up eating this dish numerous times. 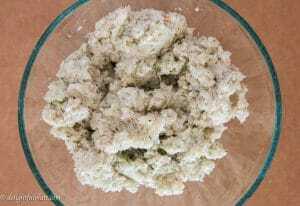 The fish cake recipe I’m introducing to you today is an authentic one. I cheat a little bit with the broth though. Our traditional broth for this noodle soup is fish (or pork) bone broth flavored with tomatoes. The broth in my recipe is tomato dashi-based broth, and it tastes the same as the traditional one while being much easier and quicker to cook. I also include a link to my fish bone broth recipe below. 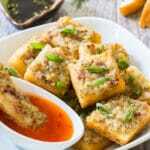 Vietnamese fried fish cake (cha ca) is tasty and flavorful. You need fish sauce, garlic, shallot, a good amount of dill and plenty of black pepper to turn plain and boring fish paste into mouth-watering fish cakes. Please be generous with black pepper because those fish cakes need the aroma and heat from black pepper. One of the most important characteristics of Vietnamese fried fish cake is the springy and dense texture. The type of fish used plays a huge role in determining the texture. I strongly recommend using firm, dense and meaty white fish fillets (no bone, no skin). I use walleye, and the result is perfect. Please do not use cod fish. I tried making these fish cakes with cod before, and it was a big mistake. They stuck to the pan, didn’t develop colors properly and they were soft with no springy bite at all. Another thing I do to get the right texture is to put the fish in the freezer for 1-2 hours. The goal is to make it cold and firm, not to freeze it. Living in a small city in the U.S. now, I find it difficult to get fish bones to make broth. I need to place an order in advance, and the fish bones that come in sometimes don’t look good. 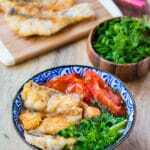 If you can easily buy fish bones, you can check out my instructions to make tomato fish bone broth for noodle soup in my Vietnamese fried fish noodle soup recipe. As I have mentioned at the beginning of the post, the broth in today’s recipe is tomato-flavored dashi broth. Dashi is a traditional cooking stock in Japanese cuisine. 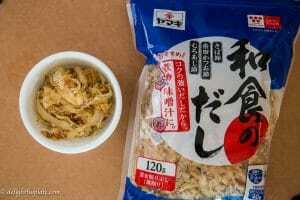 The two ingredients required are kombu (kelp) and katsuobushi (shavings of dried, smoked skipjack tuna). They are widely available at Asian grocery stores. My American grocery store also sells them in the Asian aisle. Making dashi is simple and hassle-free, compared to simmering fish bones. Therefore, using dashi to make the broth reduces cooking time while the resulting clear broth also tastes like the sea. If you don’t want to bother with making fish broth or dashi broth, no worries. Good quality pork or chicken stock will also work. 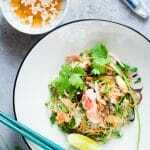 Vietnamese fried fish cake noodle soup (Bun cha ca) is tasty and satisfying. The fried fish cake is slightly crispy outside and springy inside. The clear broth is light in body, but it is packed with umami. 1-2 hours before cooking, pat dry and put fish fillets in the freezer to make them cold and firm. Use a damp piece of paper towel to gently clean kombu. 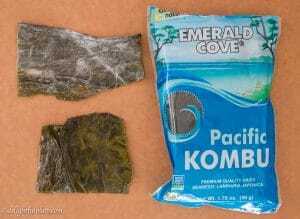 Please do not wipe off the white powder on the surface of kombu, it contains a lot of umami. Put kombu and water in a pot and place over medium heat. Bring it to a bare simmer then discard kombu. Add katsuobushi to the stock, bring it to a boil and then turn off the heat. Let stand for 10 minutes, then remove katsuobushi from the broth. Turn on the heat. Quarter tomatoes. Add tomatoes and 1 1/2 tablespoons of fish sauce to the broth. When it starts to boil, lower the heat, cover the pot and let it simmer. While kombu is being simmered in the step 2 above, remove fish fillets from the freezer, cut into smaller chunks. Place fish and all other ingredients to make fish cake in a food processor and process into a sticky mixture. Transfer fish paste from food processor to a mixing bowl. Knead for about 2 minutes into a smooth, dense and springy fish paste mixture. While steeping katsuobushi in the stock in the step 3 above, take 1/2 tablespoon to 2 teaspoons of fish paste to form thin patties. Place a frying pan over medium high heat. Add oil and fry fish cakes until the edge is crispy and both sides are golden brown (about 2 minutes each side). Transfer to a clean plate lined with paper towel. Prepare vermicelli noodles according to package instructions. Taste broth and adjust seasoning as needed. 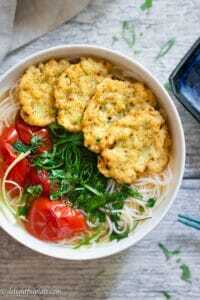 Place vermicelli noodles in serving bowl, top with fried fish cakes and scallion, cilantro and dill. Ladle the hot broth over noodles and enjoy. Our traditional broth for this noodle soup is fish (or pork) bone broth flavored with tomatoes. The broth in my recipe is tomato dashi-based broth, and it tastes the same as the traditional one while being much easier and quicker to cook. If you want to make this dish as authentic as possible, follow my instructions to make fish bone broth, or you can also use pork or chicken stock as substitutions. Oh my gosh I love you. 🙂 I love fish cakes, and I keep telling myself I will one day make it but I am so intimidated by it so I am so happy you have this recipe! 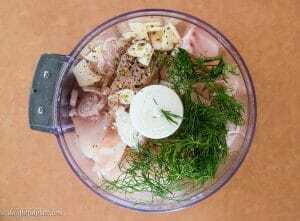 I definitely agree with you – fish cakes should be springy! Thanks Joyce! As long as you can find firm and meaty white fish, all other steps are easy and straightforward 😃. I like making a big batch and freeze them so I have some ready for quick meals ^^.